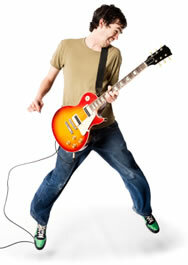 Play Guitar Blog - Be a real "Guitar Hero"
any new Web pages appear on the Learn-To-Play-Rock-Guitar.com. old website pages are updated with new info. there is a new guitar lesson, gear review or info about rock guitar and playing. I need to let you in on great rock guitar and music news. This is a quick and easy way to stay informed about all the changes here at Learn-To-Play-Rock-Guitar.com. With so much information overload in our everyday lives, quick and easy is good! In fact, if you're on Facebook, just click the Like button to the right or share this page with the button at the bottom of this page. Thanks! To subscribe to this guitar blog, right-click on the orange RSS button to the bottom left of the links (nope, you don't have to give me your email address) then paste the URL into your RSS reader. You can also click the My Yahoo, My MSN or Google buttons if you use one of those services for your personalized home page. You go out and get a job. With your first paycheck, you get a pawn shop special. Continue reading "Get a Job and Buy Your Own Guitar Contest"
Orange Music Electronic Company, Ltd. has come a long way since the summer of '68. in 2006, Cliff Cooper received the Queen's Award for Enterprise at Buckingham Palace for his contribution to international trade with the success of Orange guitar amps. Continue reading "Orange Guitar Amps"
The guitar neck joint is, very simply, the point where the guitar body and the neck meet. There are essentially three ways the neck is connected to the body: Bolted on, or the bolt-on neck, set neck or the neck-through the body. Continue reading "The Guitar Neck Joint"
So have you heard about the Jimi Hendrix guitar coming up for auction some time later this year? Yup, it'll be auctioned off by the Fame Bureau in London, U.K. September 4th, 2008. Continue reading "Jimi Hendrix Guitar in the News"
Using a free metronome for practicing guitar is helping me meet my biggest challenge head on. That challenge is to get my timing back in shape. Continue reading "Free Metronome for Practicing Guitar"
Continue reading "BC Rich Guitars"
With artists like Carlos Santana, Al Di Meola, Mark Tremonti and Derek Trucks representing PRS guitars through signature models and endorsements, the brand is a staple in most musical genres. Continue reading "PRS Guitars - Paul Reed Smith Guitars"
To get you playing songs quickly, you need to know how to play guitar tabs. Continue reading "How To Play Guitar Tabs"